In the small town of Briar Creek, you can’t avoid anyone for very long. Not that Brett has been trying to avoid Ivy. He just can’t afford to let anything distract him from his work-not again. So when a hospital fundraiser throws them together, love is the last thing on his mind. But with her quick wit and sweet laugh, soon the one woman he’s tried to keep at arm’s length is capturing his heart. 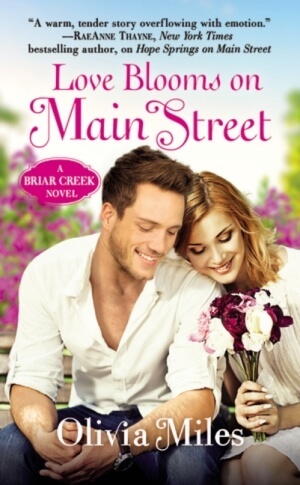 LOVE BLOOMS ON MAIN STREET is a sweet and enjoyable addition to the Briar Creek series and a reminder about dreaming big. One drawback of small towns is the fact that everyone is up in your business all the time, and Ivy Birch and Brett Hastings know all about it. With a mom who was the town drunk and the resulting gossip, all Ivy ever wanted was to fit in so she successfully hid her health issues, but she’s never really let anyone in. With her friends getting hitched around her, Ivy longs for her own loving relationship and the exciting kiss she shared with her crush Brett leads to lots of daydreams. Only Brett does not share her sentiments. For Brett, having their father abandon them to follow his mistress and then his mom diagnosed with cancer was a double punch that shaped his adult life and made him avoid relationships and commitments. While Ivy is a very sweet woman, he knows she’s a forever kind of woman and not cut out for what he has to offer. Besides, he’s back only temporarily and not interested in starting anything. So much for that resolution when they end up spending a lot of time working together on a fundraiser. When I started reading this book I really didn’t care much for Ivy because she came across as whiny and scatterbrained but she really is not. In spite of the hard knocks life has dealt her, Ivy is surprisingly whimsical and optimistic and has a quiet grace to her. Brett has his own truckload of issues and his methods of handling things is enough to make you pull out your hair, but sometimes you have to leave home to appreciate what you have. You would expect this to be a sweet and lighthearted romance, which it is but I love that Ms. Miles gave it depth by taking on serious issues and with the characters’ experiences which are realistic enough for the reader to relate to. With every new installment, the series only gets better and I’m looking forward to the rest of it.